A disabled boy is trapped after a car careers through his bedroom window. A teenager plunges 30ft from rocks and a boy is hit by a runaway truck. A major search operation is launched for a pilot trapped in his wrecked cockpit. Helimed 99 is grounded by blizzards - but their patient is suffering a heart attack. A paraglider crashes to earth and a vintage car enthusiast is runover by his own vehicle. When a trench collapses, emergency services fight to free a young builder who is trapped. A plane crash lands in a river and a veteran climber plunges down a rock face. A woodsman is injured by a falling tree and a factory worker is trapped in machinery. 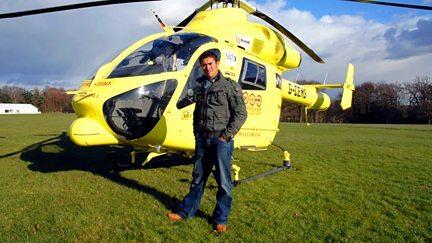 A girl is run over by a lorry and helimed pilot Matt must land in the centre to save her. Two children are run over by a reversing car, and a worker is injured in an explosion. The team flies to the rescue of a teenage canoeist after a white water accident. A young worker fights for his life after being injured by a forklift truck. A good samaritan is trapped beneath the wheels of an articulated lorry. A bride's wedding plans are wrecked when the minibus carrying the groom overturns. There is confusion when one of a pair of identical twin climbers falls off a rock face. The RAF are called in when a doctor falls down a ravine in the Peak District. A teen cyclist fights for his life. Pilot Steve faces a tricky landing to rescue a camper. A father overturns his car on a day out. An injured pigeon fancier has an unusual request. A mountain biker plunges off a cliff and a French motorist forgets to drive on the left. A quad biker falls 60 feet and a teenager is feared paralysed after a scooter accident. Helimed 99 touches down on the beach after a sun-seeker falls into Whitby Harbour. The team must save a man suffering from hypothermia after being trapped in a whirlpool. A nurse becomes a difficult patient and a pensioner's car careers down a hill-side. Pilot Steve lands in the middle of an army camp after a 10-year-old boy is knocked down. A village is brought to a standstill by a multiple pile-up, and an unsung hero helps out. A man severs his hand in an accident with a saw, but the team are determined to save it. A plane crashes on an airfield and a rocket scientist comes to earth in a bike accident. Two brothers are hurt in a bike accident high in the Derbyshire Peak District. The team prepare for an amputation after a farm worker is trapped by his legs. A boy is thrown over a garden wall in a freak road accident. The team are called to an accident involving a bus and a teenage racing driver is injured. A top jockey is thrown by her horse, and a builder is trapped beneath his dumper truck. A climber falls and breaks his leg halfway up a cliff face. The team races to save the life of the hero of a rail disaster. A pilot touches down at a garage to rescue an injured mechanic. A runner's heart stops beating and the Helimed team has minutes to save him.